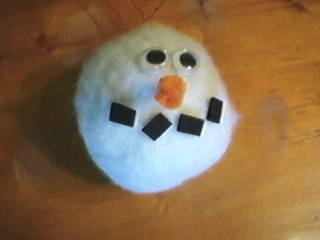 To make this easy, snowman holiday ornament, we purchased a plain, white, felted ornament and then glued on an orange pom-pom nose, googly eyes, and black foam pieces for the mouth. He has a little gold hang tag for hanging on a Christmas tree or a tree branch in a pot for a fun, winter theme indoor tree decorated with Snowmen. Enjoy! Snow Simple Christmas Tree Ornament.